I received the following press release from Elissa Scalise Powell, CG, one of the directors of the Genealogical Research Institute of Pittsburgh. I am excited for registration to open for the 2013 institute as I will be participating this year as an instructor in the land course. There is a great lineup of courses to choose from. Genealogical Research Institute of Pittsburgh (GRIP) will open registration for its six courses on Thursday, February 7 at noon eastern. These courses sell out quickly, some within minutes of registration opening. 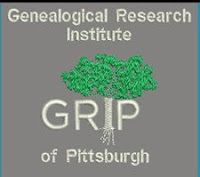 GRIP’s week-long courses will be held from July 21 through July 26, 2013 at LaRoche College, Pittsburgh, Pennsylvania. Last year students from 28 states enjoyed a small collegial atmosphere where they were able to know not only their classmates and instructors, but the other students in the intimate campus atmosphere. Dorm rooms, just steps from the classrooms and cafeteria, make off-hours fun and friendly. For more information beyond the below, visit www.GRIPitt.org where you may subscribe to email notifications of new postings, or email info@GRIPitt.org. 1.) Intermediate Genealogy: Tools for Digging Deeper with Paula Stuart-Warren, CG, FMGS, FUGA. Stuart-Warren focuses on unusual resources, manuscripts, methodology, and analyzing records. She encourages the class to bring their own family history problems for brainstorming and discussion. D. Joshua Taylor, MA, MLS and Deborah S. Mieszala, CG, are instructors in this course. 2.) Determining Kinship Reliably with the Genealogical Proof Standard with Thomas W. Jones, Ph.D., CG, CGL, FASG, FUGA, FNGS. Learn how to achieve genealogical proof by planning and executing focused research, citing the resulting sources, testing the evidence they contain, assembling that evidence into a conclusion, and explaining it clearly. Jones has edited the National Genealogical Society Quarterly since 2002 where many proof arguments are published. 3.) Bridging the 1780-1840 Gap: From New England to the Midwest with D. Joshua Taylor, MA, MLS. Explore the migration patterns across New York, Pennsylvania, and Ohio which left a scarcity of records and researchers more than one “brickwall” problem. Learn the methods and tools to overcome these challenges. Taylor is a former Director of Education and Programs at New England Historic Genealogical Society, and has appeared on the television program “Who Do You Think You Are?” Other instructors are Deborah Mieszala, CG, Richard Sayre, CG, CGL, Craig Scott, CG, and Paula Stuart-Warren, CG. 4.) Your Immigrant Ancestors’ Stories: Writing a Quality Narrative with John Philip Colletta, Ph.D., FUGA. Having researched the stories, now it’s time to share what you know! Learn how to incorporate documentary information, family lore, and artifacts into a work that your relatives will enjoy reading. German, Irish, and Italian case studies will be enlarged with sample sources for other nationalities, colonial times to 20th century. Hands-on exercise lets you practice writing. Dr. Colletta is the author of They Came in Ships, Only a Few Bones, and Finding Italian Roots. Michael Hait, CG, is an instructor. 5.) Advanced Land Research: Locating, Analyzing, Mapping with Rick Sayre, CG, CGL and Pam Sayre, CG, CGL. Understanding land history and records is essential for successful research and kinship determination. This course explores land distribution in the current United States by colonial powers, private land claims, federal land records at both the National Archives and the General Land Office, and local-level county or town deeds. Use of software and Internet resources is practiced in hands-on computer labs. Angela Packer McGhie is also an instructor. 6.) Military Records: From Cradle to Grave with Craig R. Scott, CG.